Mow around the edge of your lawn first to ensure that you have a turning border. Make sure the mower’s wheels don’t drop off the edge and scalp the grass. Now start from one side, mow in a straight line and turn at the far edge of the lawn. Line your mower to overlap the strip you’ve already cut, then repeat. Empty the grass box when you’re finished. A full box will leave clippings on the grass or clog the mower. If you have time, it’s best to mow twice a week in the summertime and once a week in spring / autumn. During dry periods, we recommend raising the cut to allow the grass to retain more moisture. Try to alternate the direction of your cut. The first cut of the year in spring should use a high setting for a slight trim to tidy up the lawn and collect debris. Never cut the lawn shorter than 1.5 inches. Remember the 1/3 rule of lawn mowing: never cut off more than a third of the grass’s height in one go. The above rule applies even if it’s been a long time since your last mow (perhaps the weather has been bad, or maybe you went on holiday) and the grass is getting very long. Make sure the mower blade is sharp and that your machine isn’t leaking petrol. Do not fill the mower with petrol while it’s on the lawn – petrol spills can damage the grass. Try to avoid mowing on frosty or wet days. Get your mower regularly serviced (including sharpening the blades). 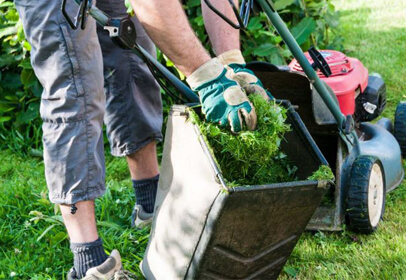 Here at Lawn & Weed Expert, we provide a variety of professional lawn services including seasonal treatments, scarification and weed / moss control. If you need our help, please contact us today to request a FREE lawn survey.